Momentum Set by Ayuna is a topical cleanse that makes skin feel awakened, rejuvenated, and healthy. The kit includes four skincare products designed to offer a detoxifying effect that results in a balanced, youthful, glowing appearance. The first step is an artisan bar soap made with olive and coconut oils to cleanse the skin while lending a light touch of moisturization. Second is Essence, a creamy oil peel that utilizes fruit oils and probiotic ingredients to reveal smooth, soft, even looking skin. Next up in the regimen is Balm, a treatment mask formulated with activated charcoal and pullulan (a natural sugar) that gives skin a purified feel and a tightened appearance. The final step in the regimen is Cream, containing green carrot, pomegranate, and turmeric, this facial cream leaves skin looking regenerated and radiant. Ideal anytime skin needs a little TLC. Cleanse the skin with Soap and rinse thoroughly with warm water. Next, apply a layer of Essence to clean skin and allow to remain on skin for 5 minutes. Massage gently with fingers, then rinse with warm water. Now apply a thin layer of Balm and allow to remain on skin for 5-10 minutes. Remove with a wet, warm cloth in a gentle circular motion. Follow up by applying Cream to clean skin for a feeling of nourishing moisture. Perfect for use on skin that looks and feels tired, saggy, dry, rough, and in need of special care. I first tried Ayuna products with the August subscription. Fell in love with the cream then was curious about the other products. This set is well worth the money!!! You won’t regret it once you try these products!!! Beauty Heroes is the best!!! I got my products super fast!!! I’m a lifer with these products! My skin loves it! Soap is very nourishing, not drying at all! Essence is absolutely a must!!! Skin is so soft! The balm tightened my skin without being uncomfortable and you know I LOVE the cream! I’ve got to say I didn’t like the smell at first but after a few minutes, you keep smelling it and then you’re thinking, hmmm it’s actually nice, until now I’m in love with that smell!!!! So clean, peaceful and calming... love Ayuna! Thank you Beauty Heroes for this introduction to great luxe products!!! Great value for Ayuna lovers. 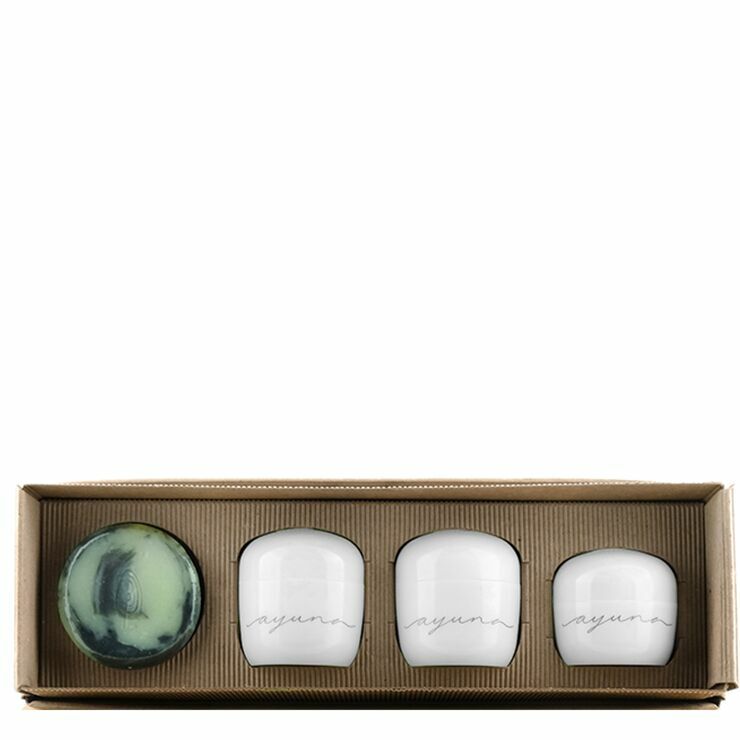 I purchased this for myself because I love all the Ayuna products and I wanted to replenish them. I used to spend money on other face masks, but not any more. I do the Essence and then the Balm and my skin is incredibly firm and youthful and soft--better results than from any other mask ever. I do this on the weekend to get ready for the week. The Cream II is a daily staple that keeps my skin more buttery and youthful than anything else I've ever tried, and the soap is simple and delightful. This box is an amazing bargain. All four products separately cost $511 to purchase, whereas the box is priced at $400 and with the Beauty Heroes discount cost me only $340. That is a $171 savings, or 33% off total from buying each product individually. Since I don't want to be without any of the Ayuna products ever again, this is how I will be purchasing them. I hope the Momentum box remains a permanent offering!